This fresh approach will give you a complete set of tools to work with anxiety symptoms. Cutting-edge research tells clinicians not only what is new, but also tells us why what we have done best over the years works to help clients achieve positive results in therapy. In this seminar recording, you will learn, practice and be ready to apply 10 techniques that really work to stop symptoms of panic, worry and social anxiety. These 10 proven methods can control most symptoms of panic, generalized anxiety and social anxiety. Through in-seminar practice and discussing case vignettes to illustrate their applications—you can make them strong, effective and lasting interventions. Methods that control physiology: diaphragmatic breathing, reducing tension, mindful awareness to offset panic or acute anxiety can be easy to learn but not simple to apply. We will discuss how to make them effective with different age groups and difficult clients if you want to obtain the best results for calming panic and dread. Likewise, controlling the cognitive problems of anxiety, such as catastrophizing or ruminatively worrying, challenge most with anxiety. Learn powerful techniques that cool off worry (“Worry well and only once!” “Knowing, Not Showing Anger”), and challenge faulty cognitions, the obstacles to improving panic and social anxiety (“Counter Cognitions”, etc.). You can help your clients identify and change the ways they avoid their social anxiety. Case examples will clarify planned re-entry to triggering situations, handling the stress of preparation and conducting in vivo exposure. 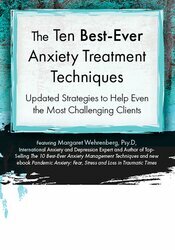 Articulate the neurobiological causes of panic, generalized anxiety and social anxiety and ascertain how this information impacts treatment decisions.